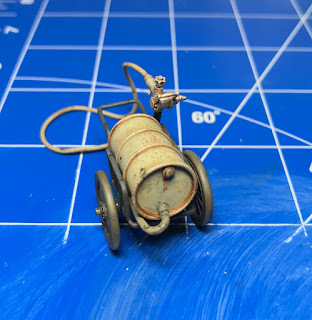 "Here is my 1/48 airfield oil cart from Brengun. 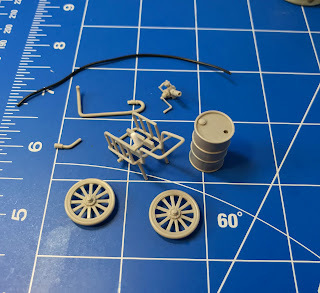 The kit itself is all resin, and well cast. 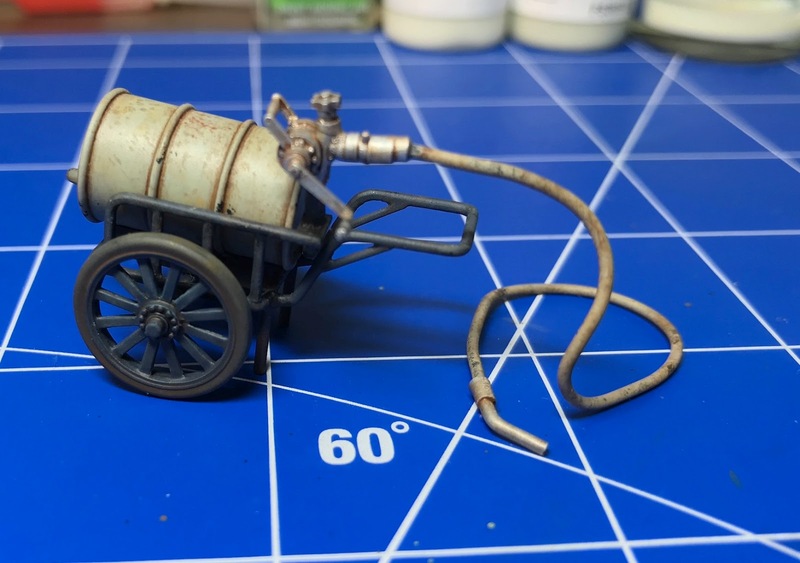 The only piece not included in the kit is the hose, which I sourced from my local hobby shop. "The parts have some flash, but nothing difficult to remove. Care needs to be taken removing some parts from the casting blocks, the crank/pump part split and flew across the room. 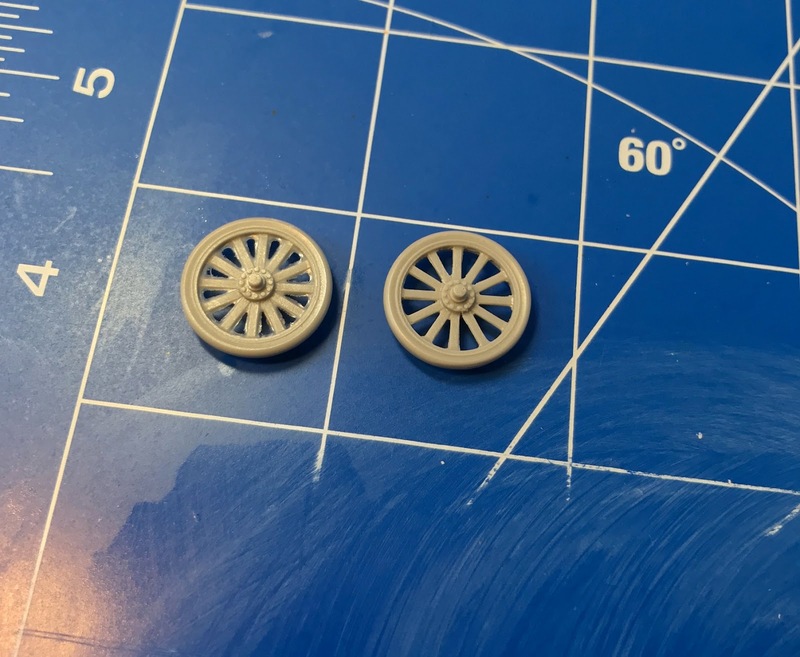 Thankfully it was a clean break and easy to find! 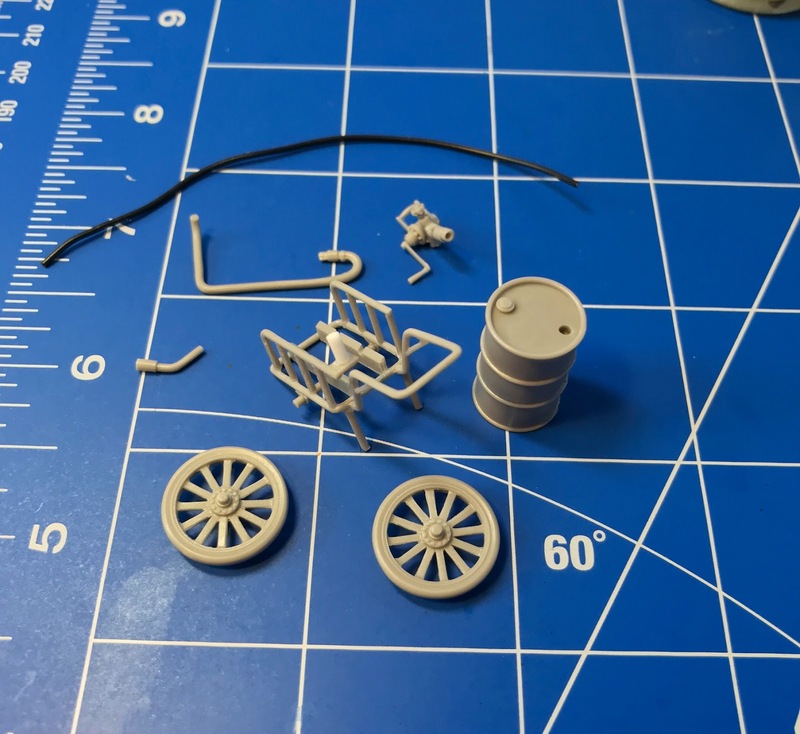 "Also, the pump will not fit on the cart frame where indicated per the instructions. 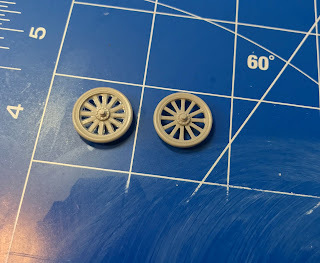 I added a short piece of styrene rod as a riser, then installed the pump on top of this. Otherwise, it will not fit once the oil barrel has been placed. "I used Tamiya spray paints for the main parts, and Vallejo acrylics for the detail work. 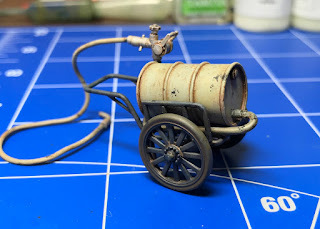 Weathering was with artist oils, chips were applied using a small sponge and Vallejo acrylics, and finally the splashed grime was an enamel wash. Final clear coat was Gunze Mr. Super Clear Matt. "Brengun makes this oil cart in 1/32 scale as well, and will also release a 1/48 airfield fire extinguisher this summer. 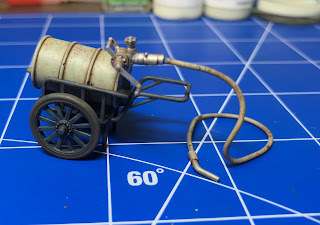 Hasegawa offers this same apparatus in 1/48 plastic with their Isuzu TX40 fuel truck, and it is a nice little kit. I feel compelled to support any small model company that releases Japanese subjects, and have a copy of the extinguisher on order from HLJ. Buy with confidence...."
With special thanks to Dan for these images and the report. 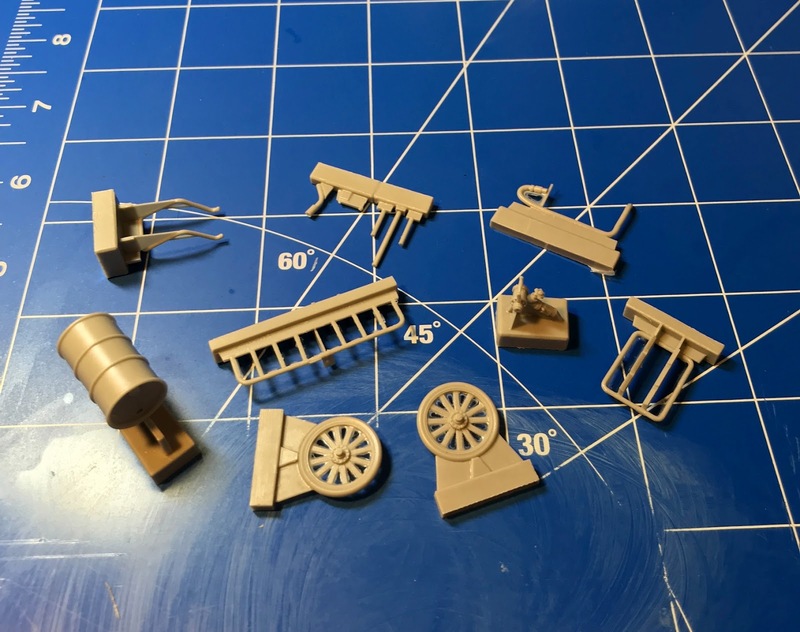 These type of airfield accessories and vehicles can really enhance the display of an aircraft model, with or without figures, and I hope that we see many more of them in future. There is no shortage of subjects, both purpose built or improvised. 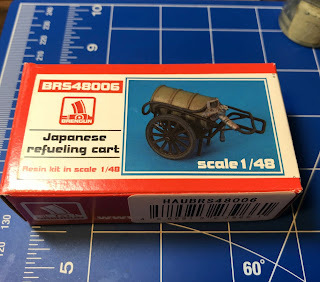 IJN REO Speed Wagon refueling truck anyone? 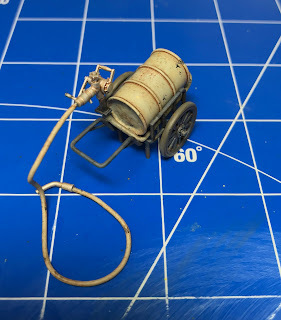 I have the Verlinden 1/48 Luftwaffe Airfield Oil Service Cart for my Focke-Wulf 190 Diorama - and it does add a lot of extra detail . Great little gem Dan. Congrats. What about the fire extinguisher form Brengun? Great little gem, Dan. Congratulations ;-). What about the fire extinguisher form Brengun??? Nice stuff im buy a dozen. 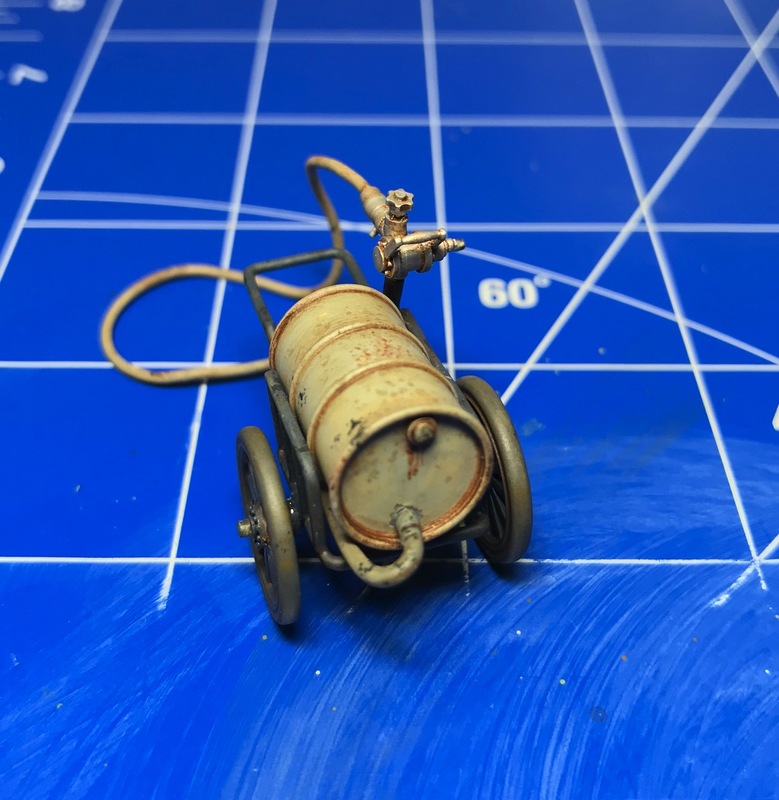 A wonderful little model. I love vehicles that make the display of airplanes livelier. I was building dioramas when I was young. They still make me smile. Well done Dan! Thanks for the kind comments everyone! The fire extinguisher kit will be released this month, and plan on building it soon after it arrives. I have another ground vehicle nearing finishing stages on my table, and look forward to sharing it here once complete. If I ever have a display space large enough, would love to scratchbuild something like a late war control tower/apron and have various aircraft and support vehicles around it. A modeler can dream, right? I always love seeing support equipment and vehicles built and displayed. Thanks for sharing this. Good work, Dan. Thanks for sharing with us.